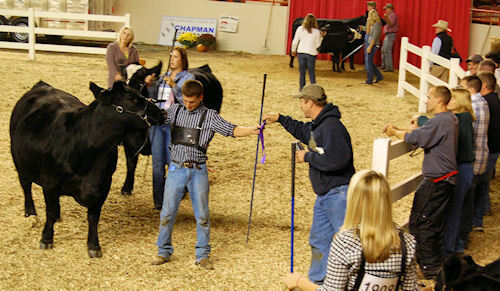 55th KILE to draw more than 3,500 livestock, 870 exhibitors to Harrisburg, Pa. The 55th Keystone International Livestock Expo gets underway tomorrow and runs through Oct. 9 at the Pennsylvania Farm Show Complex in Harrisburg, Pa. It's the largest livestock show on the East Coast, reports Pennsylvania Ag Secretary George Greig. This year's competition will fill the show rings with 1,100 beef cattle, 500 horses, 1,000 sheep and 950 swine coming from 32 states. Youth will compete in the Collegiate and Junior Livestock Judging contest and Keystone Stockman's Contest. Involvement from youth participants is a key part of the show's success. Nearly half of the exhibitors are under the age of 21. LOOKS LIKE WINNER! Young people stroll their best animals into the ring, looking for prize-winning vindication of all their animal care labors. Five horse breed shows plus the North American All-Breeds 6-Horse Hitch Classic Series Show. Twenty-seven cattle shows featuring 14 breeds, 28 sheep shows with 14 breeds, and 11 swine shows with nine breeds. Twelve animal sales are also planned. The Bell & Evans "Gold Wing" and Weaver's Best Bologna contests on Friday, Oct. 7. The Keystone Classic Barbeque Contest is slated for Saturday, Oct. 8. The Bell & Evans "Best Legs in Town" people's choice barbeque contest is also on Saturday. Keystone Lead Line will be held Saturday, Oct. 8. Agri-Kid Olympics and the Power Pedal Pull also are held that Saturday. And, the fifth annual Youth Beef Benefit Auction will offer its proceeds to the Beef Scholarship program, providing two beef youth with $1,000 and $500 scholarships on that day.